Vauxhall has started its 2017 SUV push with the launch of the Crossland X. The compact SUV will rival the Renault Captur and cost in the region of £15,000 when it reaches showrooms in the summer. The Crossland X marks the first of two new SUVs from Vauxhall in 2017, with the larger Grandland X due later in the year. The Mokka has already been given the X rebrand, with the 'X' now identifying all of the SUVs in Vauxhall's car line-up. The Vauxhall Crossland X will be 160mm shorter than the Astra and sit closer to the road than the Mokka, but boast more boot space than both with 410 litres. The rear seats will also be movable - by 150mm - and feature 60/40 split folding. Unlike the Meriva - which the Crossland X will replace - there will be no rear-hinged rear doors though, but Vauxhall is promising space and comfort for up to four adults. There are no details on engines yet, other than a broad statement on an extensive "petrol and diesel engine portfolio with manual and automatic transmissions". However, we'd expect Vauxhall's excellent three-cylinder 1.0-litre petrol to feature, with claimed economy in the region of 60mpg. Trim levels are also still to be confirmed, but expect high spec models to get an eight-inch colour touchscreen, compatible with Apple CarPlay and Android Auto. Vauxhall’s automatic parking system - advanced park assist – should also make it into the Crossland X, along with blind spot monitoring, cruise control and autonomous emergency braking. 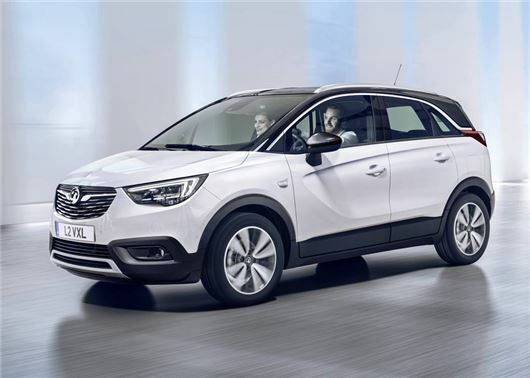 Vauxhall has already said it wants to rival the Renault Captur and Peugeot 2008, although the Crossland X will have to play catch up with buyers owing to the fact that both the Captur and 2008 have been on sale since 2013.